Searching for a water skiing resort? 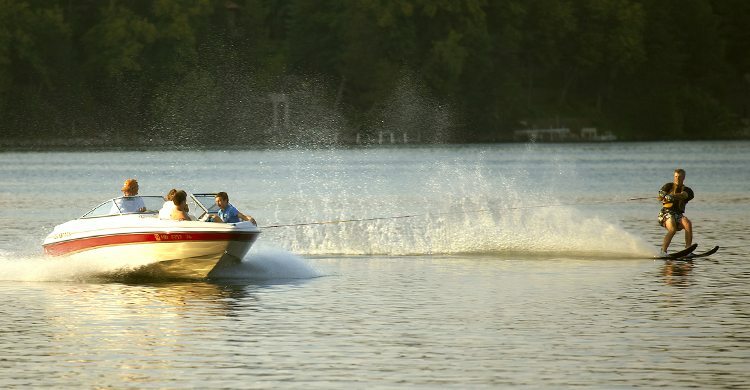 Look no further than Cragun’s Resort, home to the best water skiing in the Midwest. Water Skiing Program: A licensed, skilled instructor pilots our Ski boat. All experience levels are welcome to ski; novices, slalom skiers and wake boarders. Ages 7 to 19, $30.00 per person. Private Water Skiing Lessons: All skiers are welcome, and lessons are arranged at the Marina. Our experienced instructors can teach all skill levels from beginners to experts, whether it be skiing, wakeboarding, kneeboarding, wakesurfing or tubing. We guarantee beginners will get up on skis, or there is no charge for the lesson. A certificate of achievement is awarded to children upon successful completion of our program. Available Monday-Saturday, between 10:00 am and 6:00 pm. Includes all gear and fuel at $140 per hour or $80 for 30 minutes. To assure availability, advance reservations are requested.